The requirement is simple. I should be able to upload files to the server with jQuery and ajax. Lets get started. thefourtheyeEditor is a very lightweight plugin for Topcoder Arena to participate in Single Round Matches, which can build testcases and lets the users to store the solutions as local files, so that any editor or IDE can be used to edit them. It also maintains the solutions in the directories named as the SRM's display name. Very lightweight - Only one jar file. It doesn't depend on any other external jar files. File based configuration - Configurations are done in contestapplet.conf file. No need to use UI. Click on Add and you 'll get a window like this. Fill in the details as you see in this picture. Actually you can give any name in the Namefield and in ClassPath field, you have to locate the thefourtheyeEditor.jar file using Browse button. EntryPoint must be exactly the same as thefourtheyeEditor.Main. Last week, I faced this weird problem. When my laptop is not connected to a power source (not on battery), I could not connect to LAN network with my LAN cable, but Wi-Fi worked fine. I struggled a lot for a week and then I found a solution in the internet. All you have to do is to execute this one liner in your terminal. Here eth1 corresponds to my second ethernet interface. It might vary from machine to machine. And if the directories eth, device and power dont exist, you might have to manually create them. This is a continuation of Compiling CPP 11 Programs with Sublime Text 3 in Ubuntu where we saw how to configure Sublime Text 3 in Ubuntu 13.04 to compile C++ 11 programs. 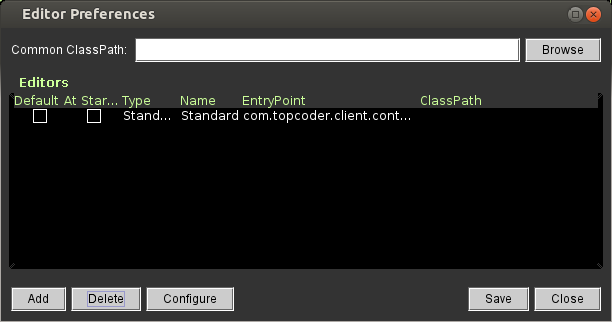 In this post, we ll see how to execute Node.js programs in Windows 7 machine's Sublime Text 3. I am going to assume that Node.js is installed properly and PATH variable is also set properly. If you are using Windows Installer, we dont have to worry about this. We need to create the following directory structure in the User's home directory AppData\Roaming\Sublime Text 3\Packages\JS\. In my machine, home directory is C:\Users\[username]. To know the current user's home directory, open Cmd.exe and type echo %userprofile%. In that directory, create a file called "JS.sublime-build". So, the location of the file from the home directory is AppData\Roaming\Sublime Text 3\Packages\JS\JS.sublime-build You can name the sublime-build file as anything you want. I have simply named it here as JS. Copy and paste the following text in to it. Thats it. Open Sublime Text 3. Click on Tools->Build System. You should see JS as one of the options. From now on, you can execute node.js scripts simply by pressing Ctrl-B. Today I installed Sublime Text 3's public beta on my Ubuntu 13 and the first thing I noticed is, the inability to compile C++ 11 programs. The obvious problem is, it was missing -std=c++0x parameter to g++. I tried to figure out how to edit the build parameters of Sublime. After an hour's struggle managed to figure out. You need to create the following file ~/.config/sublime-text-3/Packages/C++/C++.sublime-build. The ~ refers to the home directory of the current user. Save this file and close it. Sublime will pick up the changes immediately. This will take care of compiling C++ 11 programs.